An inquiry into the Dangerous Dogs Act and breed specific legislation is now open for written evidence. The Environment, Food and Rural Affairs Committee is launching an inquiry into the legislation on dangerous dogs. The Dangerous Dogs Act 1991 was introduced to protect the public from dangerous dog attacks. The Act made it an offence to keep four types of dog traditionally bred for fighting - the pit bull terrier, Japanese Tosa, Fila Brasileiro and Dogo Argentino - unless the dog was placed on the Index of Exempted Dogs and kept in compliance with certain requirements. There has been substantial debate about the effectiveness of this legislation and the impacts on dog welfare. According to the RSPCA, 30 people died between 1991 and 2016 in dog-related incidents, of which 21 involved dogs of breeds/types not prohibited by the law. The number of attacks has also risen, with yearly hospital admissions for dog bites increasing by 76% between 2006-2016. “The Government is responsible for protecting the public from dangerous animals, so it is essential that laws evolve alongside our understanding of what works. “The 1991 Dangerous Dogs Act banned four specific types of dog, but since then attacks have continued and 21 people have been killed by non-banned types. “My Committee will investigate whether the Government's current approach is having the desired effect, and whether any changes are needed to ensure that the public is properly protected and that animal welfare concerns are properly addressed”. How effective is the Government’s current approach to protecting the public from dangerous dog attacks? What changes, if any, should be made to the current approach and legislation? How can local authorities and police forces be best supported in reducing the number of dangerous dog-related incidents? What lessons could the UK learn from other countries dealing with similar issues? Written evidence should be submitted through the Committee’s web portal by midnight on Wednesday 6 June. It is recommended that all submitters familiarise themselves with the Guidance on giving evidence to a Select Committee of the House of Commons which outlines particulars of word count, format, document size, and content restrictions. Banning third party sales of pets in England: call for evidence. Defra are inviting evidence from all stakeholders and experts on the effect of introducing a ban on third party sales of puppies and kittens in England. This ban would mean that pet shops, pet dealers and other outlets and licensed sellers of puppies and kittens would be unable to sell these pets unless they themselves have bred them. Presently, DEFRA are seeking people to send them evidence which will specifically help them to understand the effect of introducing a ban, and any limitations of doing so. DEFRA do not want people to send in their wider opinions at this stage. Defra are seeking views on banning the use of electronic training collars (e-collars) and you have until Friday 29th April 2018 to submit yours. Defra recently announced proposals to ban two types of e-collars for cats and dogs. The proposal is to make it an offence to use an e-collar, or to put one on a dog or cat, or be in charge of a dog or cat that is wearing one. This would bring England in line with the law in Wales - where they have been illegal since 2010. Electronic shock collars are sadly easy to purchase, these barbaric devices are used to deliver a shock to the neck, either via a remote or automatically. The DEFRA consultation can be completed online here. Petition: There is a UK Government Petition created by Ben Macpherson MSP to ban the sale of electronic training aids for dogs, the petition urges Government to ban the distribution, sale and use of any electronic training device for dogs. This petition urges the UK Westminster Government to ban the distribution, sale and use of any electronic training device for dogs, and ensure it is an offence to cause pain or distress to dogs through the use of such devices in England. This petition also recognises that some specific devices, such as collars which only vibrate, offer potential benefits in certain circumstances such as when dealing with dogs suffering from hearing loss. This petition will run to the 8th August 2018 and when it reaches 10,000 signatures the Government will respond (currently awaited). At 100,000 signatures the petition will be considered for debate in parliament. UK Government Petition can be found here it runs for six months closing on the 6th April 2018. "Fireworks cause alarm, distress and anxiety to many people and animals. We call on the Secretary of State to make appropriate provision to secure that the risk of public use is the MINIMUM that is compatible with fireworks being used, as stated in Fireworks Act 2003 sect 2." The fireworks parliamentary debate can be found here. Government takes the issue of firework safety very seriously. There is legislation in place that controls the sale, use and misuse of fireworks; we have no plans to extend this further. The Government takes the issue of firework safety very seriously. There is legislation in place relating to the supply, storage, possession and use and misuse of fireworks. This includes legislation which regulates the supply and use of fireworks, both for the general public and professional display operators. Restrictions on the sale and use of fireworks are set out under the 2003 Fireworks Act, the Fireworks Regulations 2004 and the Pyrotechnic Articles (Safety) Regulations 2015. These contain provisions to minimise the risk of fireworks harming people, property and animals. Although a small minority of people use fireworks in a dangerous, inconsiderate or anti-social manner, we believe that the majority use them sensibly and responsibly. The Government is aware of concerns about the distress noisy fireworks can cause to individuals, as well as to livestock, pets and wildlife. Therefore, the Government urges those using fireworks to be considerate to their neighbours and give sufficient notice of firework use, particularly to those who are vulnerable such as older people, children, those with mental health issues such as post-traumatic stress disorder (PTSD), and those with pets and livestock. We have worked with the fireworks industry to encourage users of fireworks to give notice of their displays so that those who are vulnerable or keep animals can make arrangements for their safety. The Blue Cross animal charity has also produced information on animals and fireworks, which gives advice on how to avoid or reduce stress to animals when fireworks are being set off. The Royal Society for the Prevention of Cruelty to Animals (RSPCA) and the Kennel Club provide similar advice on their websites concerning how to minimise the impact of fireworks use on animals. There is already a ban on the general public from purchasing fireworks with higher levels of risk and noise and seasonal limitations on their sale. The Fireworks Regulations 2004 restrict their sale to the traditional fireworks periods around 5th November, Diwali, New Year’s Eve and the Chinese New Year. These are an important part of British tradition reflecting our history and multi-culturalism. While it is possible to buy fireworks at other times of the year, a ‘licence to sell fireworks’ is required and strict conditions are imposed outside the traditional periods. At present any firework that exceeds 120 decibels must not be supplied to consumers. There are also low noise fireworks available that consumers can choose to buy, but we do not propose to bring in regulations to require all fireworks to be low noise. Government acknowledges that many people have genuine concerns about the use and, the misuse, of fireworks and the risks of firework-related injury. However, the number of injuries is low and the total number of hospital admissions caused by firework injuries has remained below 200 a year for the last 10 years. The Government does not plan to make any changes to the way statistics relating to enforcement actions are collected. The Government believes the focus of enforcement should be on delivering necessary protections and on working with businesses, citizens and others to ensure safety. The Government believes that the current regulations strike the right balance between the enjoyment of fireworks by the public and restricting the sale and use of fireworks for public safety reasons. The best way to continue to reduce the distress caused by fireworks is to work with industry, retailers and others to promote the safe and responsible use of fireworks through guidance and public education and to ensure that appropriate action is taken against those that break the rules. The obligations for the Secretary of State referred to in the e-petition, to publish a regulatory Impact Assessment and to consult interested organisations, only apply when making new regulations and we have no plans to change the legislation relating to fireworks. As set out above, given there is already legislation in place which controls the sale and use and misuse of fireworks; we have no plans to extend this further. 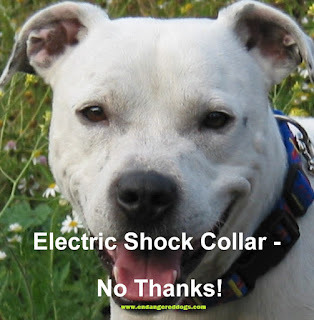 The Scottish government has recently confirmed that the use of electric shock collars on dogs is to be banned in Scotland. The announcement follows a campaign by MSPs as well as organisations including the Kennel Club, the Scottish SPCA and the Dogs Trust. Initial draft guidance been published with the ban to be introduced through guidance issued under the Animal Health and Welfare (Scotland) Act 2006 in the coming months. Draft guidance states that: "Causing unnecessary suffering is an offence under the Animal Health and Welfare (Scotland) Act 2006. This includes suffering caused by inappropriate training methods." Once the guidance has been finalised, the courts will be able to take it into account when establishing liability in a prosecution. The Scottish government previously said (November 2017) that it would tighten the restrictions but would allow their use under supervision, a qualification for those using the device was to be recognised, this will now not be created. The collars are not banned in England, but are in Wales. In light of concern regarding the potential misuse of electronic training collars (e-collars), we intend to issue Guidance on these and other training methods under Section 38 of the Animal Health and Welfare (Scotland) Act 2006. We will issue guidance, under that Act, to make it clear that training which includes unpleasant stimuli or physical punishment can cause pain, suffering and distress and that any such pain, suffering and distress caused by an inappropriate training method, including electronic collars, may constitute the offence of causing unnecessary suffering under that Act. In due course this guidance may be incorporated into a revised Code of Practice or wider Guidance for the welfare of dogs, along with additional guidance on other topics of dog welfare not currently covered in detail in the Code of Practice for the Welfare of Dogs. Should you wish to comment, please email electronictrainingcollars@gov.scot by Wednesday 14 February 2018. Dog lovers have united worldwide in peaceful protests, rallies and awareness days which have taken place in a united global day of anti-breed specific legislation events this month. The UK joined the global day of action once again and London took part with a peaceful protest, the Westminster event was held on Saturday 15th July and there were also awareness day events in Coventry West Midlands and Cardiff, Wales. The Westminster protest was organised by DDA Watch Ltd, a campaign group which helps and supports dogs and their families affected by the Dangerous Dogs Act 1991 and this years' event marked 26 years of failed, unjust dog law in the UK. Ottawa, Winnipeg, Ontario, Halifax, Montreal, Toronto, Barrie, Truro, Nova Scotia in Canada and Germany also held anti-BSL events for the 15th July as part of the Global Anti-breed specific legislation issue affecting dogs and their families world wide. 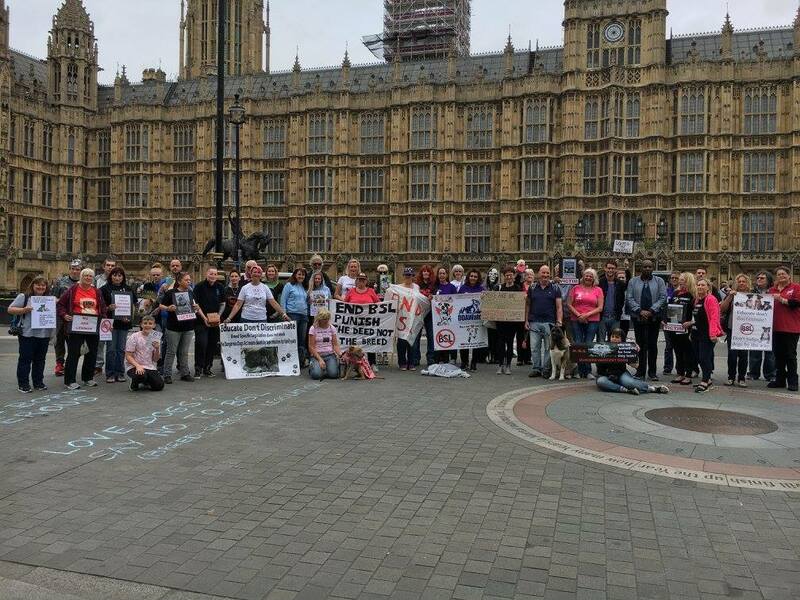 Dog lovers travelled across the UK to unite and take a stand for innocent dogs and to call for a repeal of a failed piece of legislation that targets types of dogs and condemns them as 'dangerous' based on their physical appearance. 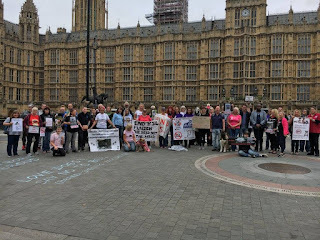 The Westminster protest was a grass-roots gathering, with volunteers present who actively campaign and support innocent dogs and their families being torn apart by breed specific legislation on a daily basis. Attending to support the event was veterinary surgeon and animal behaviourist Dr Kendal Shepherd MRCVS, canine behaviourists Robert Alleyne and Jordan Shelley and dog trainer for film, television and stage productions, Robert Stuhldreer with his beautiful assistance dog Flora. One supporter was dressed as the 'Grim Reaper' with a message for Defra attached to the black outfit which said 'I am Breed Specific Legislation' and gave out information leaflets to those passing by outside the Parliamentary buildings. Giving out plenty of canine kisses was the beautiful Staffie named 'Whippet', a Battersea Dogs Home Ambassadog who came along to support the event with her mum, Chris McLean. Whippet wore her special pink coat with the words 'Breed Specific Legislation Murders My Friends' written on it, raising awareness for her doggy pals. At the event in central London, there was a large white sheet headed ‘People’s Messages to Defra – 26 Years of Tears’ and dog lovers wrote their own personal messages to be sent to Government; some in memory of much loved dogs who had never put a paw wrong and have been killed by the outdated legislation. Another precious dog named Paul was remembered, heartbreakingly his casket of ashes was brought to the protest to show the end result of many dogs affected by this harsh and unfair legislation. Paul had lost his life in 2015 and campaigners shed tears as his casket was placed in remembrance at the event. Banners and placards were held high just outside the mighty buildings of Westminster where the law which condemns dogs based on their appearance was first passed 26 years ago; a young supporter who had travelled a considerable distance held up a photograph of Lennox, a canine victim of breed specific legislation from Northern Ireland whose death five years ago this month had sparked global outrage and condemnation, bringing the injustices of the legislation to the attention of thousands of people across the world and leaving a legacy of hope that disastrous BSL will one day end. Another innocent dog named Blitz who has been tragically sentenced to death under the barbaric law and endured two and a half years imprisoned on canine death row was remembered and many members of the public were shocked to learn that this is what can and often does happen in the UK and overseas, to pet dogs who have never bitten or hurt anyone. Several people who stopped to speak to the campaigners expressed their disgust and shock that this legislation exists in Great Britain and other parts of the world. Over two thousand DDA Watch leaflets were distributed in central London and further petition signatures were gained to help create awareness of the situation which campaigners say is long overdue for repeal. Hyndburn Stray Dogs in Need-Lancs. Endangered Dogs Defence & Rescue Ltd. Simple theme. Powered by Blogger.